Well if you are one to do McDonalds for breakfast you'll notice the sausage and egg McMuffin has a slice of cheese in it, so perhaps we're not entering a fifth dimension here with cheese appearing actually in a sausage relationship perhaps. 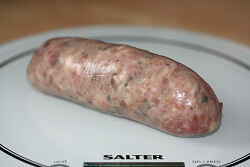 From another sausage review web site in the USA that we are in touch with (sausagereviews.com), we note that it seems perfectly in order to add cheese (with jalapeno chillies!!!) to sausages over there! 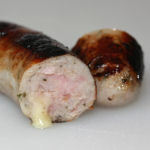 These sausages are based on the Churchgate Lincolnshire recipe, with approximately 10% bacon and 10% cheese. They cook up pretty good, a little bit of ooze though from the sausages in to the pan (that's the cheese no doubt) which can if you're not hovering over will turn quite brown and stick to the outside of the skins. These sausages are "different" in flavour and although I did like them in a sandwich, with a sausage and mash for instance, I'm not so sure. The troops here were not so taken with them unfortunately, but me personally I could eat some more. Really different, and really good. 105x30mm before cooking, 100x30mm after. 85g before cooking, 75g after.